It’s been over half a year since the brutal murder of Archbishop William de Laurent during his pilgrimage to Davillon. And in all that time, Widdershins has truly tried her best. She’s tried to take care of Genevieve’s tavern and tried to make a semihonest living in a city slowly stagnating under the weight of an angry and disapproving Church. She’s tried to keep out of trouble, away from the attentions of the Davillon Guard and above the secrets and schemes of the city’s new bishop. To say that I loved False Covenant would be an understatement and I think the name Widdershins will be on the lips of fantasy readers everywhere this year and for many to come. There are several things that make this book an excellent read. The Setting – Davillon has a renaissance France feel to it. The city is rich, vibrant, and full of life. I was easily able to picture everything from the cobblestoned streets to the church architecture due to Ari’s descriptive prose. The city came alive and made me want to wander the streets and get lost in the crowds. Based on what we have seen of Davillon, I can only imagine what wonders the rest of Ari’s world holds for us. The Villain – Ari created one of the creepiest and most original “bad guys” I have read in some time. Scenes from The Ring and The Grudge came to mind as the creature skittered across the pages. I would love to know the thought process that went into creating this creature, or maybe not, reading about it was creepy enough, and it’s genesis might really give me nightmares. Even though there was a demon that had to be defeated in the first book, this creature brought things to a whole new level, requiring not only Widdershins and Olgun’s skills, but the help of friends and enemies alike. I love it when I read an unforgettable villain and it just goes to show Ari’s writing skill in making original and multi-dimensional characters. The Characters – I know this one is rather obvious, as what is a story without the characters, but it still merits mentioning. Widdershins has been through so much it is hard to believe she is as young as she is. Even with all the wise cracks and bravado there is a vulnerable side to Widdershins. There is some romance in the story but nothing over the top as to take away from the story. It is quite sweet and endearing and adds to the character’s depth, to both Widdershins and the others involved. I really like Widdershin’s banter with Olgun, it adds some levity to the book even during the most serious of times. Their bond is such an interesting and intergal part of the story. I mean, how cool is it to have your own personal god? Ari’s characters, Widdershins, Robin, Julien, and Renard, are all people I can relate to, which further anchored me in the story. The Ending – I will try not give anything away about the ending other than it was epic, and by far one of the best “endings” I have read in some time. Did I want the book to end the way it did? No, but did I absolutely love the ending? An emphatic yes. I love when authors do this to me. They draw me into a book and I fall in love with the characters (or at least a serious like),and then one leaves the story even though I want them to stay. This ramps up the tension and leaves me dying for more. This is another thing I like about Ari’s writing, he is not afraid to sacrifice a character in order to craft a great story. 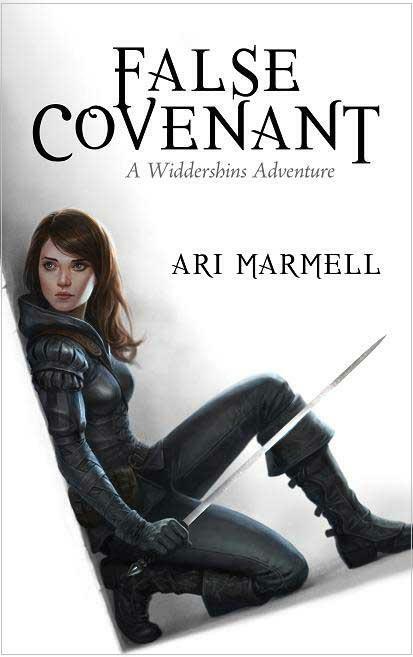 The first book, Thief’s Convenant, was a great read, but Ari shows that can make “great” even better with False Covenant. I give this book 5 stars and highly recommend it to readers young and old (and anywhere in between). This review was of an ARC I received from the publisher Pyr. Posted in Book Review. Tagged Ari Marmell, new release, Pyr. I just finished False Covenant, too, and need to think on it before I come up with my own review. I was happy to hear that Ari will be doing two more Widdershins books.